Thousands of accidents every summer are caused by a lack of safety precautions in family swimming pools throughout the country. Pool safety isn’t optional. Thousands of accidents every summer are caused by a lack of safety precautions in family swimming pools throughout the country. Even basic parts of your pool, like the pool cover, pool fence, and pool drain can cause tragic drowning accidents if proper safety precautions aren’t there. How can you ensure that your pool is safe? Staying aware of the weather while enjoying the pool. Summer storms can come along quickly and do a great amount of damage. Never stay in the pool during a thunderstorm or when lightning is in the air. Make sure that every adult in your family has knowledge of proper lifesaving techniques, like CPR. These basic techniques can save your child’s life if they drown. Installing a pool fence and locking it whenever an adult is not down near the pool. This is a great way to protect both pets and kids from accidentally entering the pool area. Using a pool cover that is sturdy and that won’t fall in if someone falls on top of it. This is important during the winter months as well, as many people fall into pools by accident when clearing snow. Whether you need a new pool cover or are looking for the perfect pool for your home, Sunrise Pool Builders are here to help. We are happy to walk you through every step of the design process and ensure that your pool or spa meets the needs of every member of your family and all of the activities you want a pool or spa for. 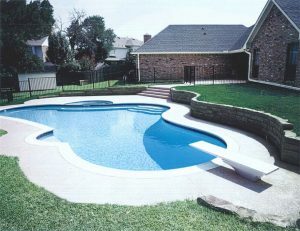 If you are ready to design the perfect pool or spa for your home, contact the experts at Sunrise Pools & Spas. For more information on our services, contact us online or give us a call at 410-349-3852. To see examples of our work, check us out on social media on Facebook, Twitter, LinkedIn, Pinterest, and Google+. This entry was posted on Friday, August 4th, 2017 at 5:10 pm. Both comments and pings are currently closed.